I don’t know why some people snark on Nancy Meyer’s movies. I love most of them because I love they make me feel, so what’s the rub? 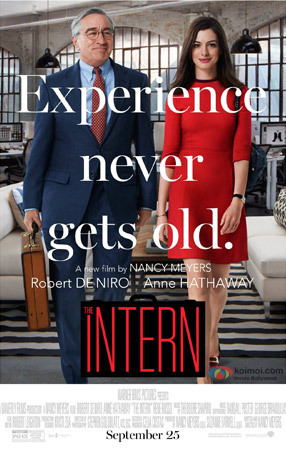 I know, yes they are art-directed within an inch of their lives, but don’t you want to look at pretty things when you are watching a movie/ Her newest, “The Intern” follows the formula of a romantic comedy. Boy meets girl, boy loses girl, they get back together. Only this time, the relationship is between Jules Ostin, a CEO of an e-commerce company, and her “senior” intern, Ben Whitaker. Anne Hathaway and Robert De Niro are pretty much perfectly cast – they have a relaxed and vibrant chemistry, and you aren’t able to take your eyes off them. The 120 minute running time (a bit long, if I may be honest) goes by relatively quick, and in the end, the film satisfies. I know there are a lot of Hathaway haters and I never got that – she is a formidable actress, and in here she effortlessy essays the role of Julie. In the hands of a lesser actress, this could have been an unsympathetic role, but she injects the character with intelligent and charm. As for DeNiro, we have seen him do these comedic roles in the more recent part of his career, but what makes this more effective for him is his easy banter with Hathaway. Aside from a jarring scene in the middle of the movie that seems to be out of s different film, the tone for every scene is perfect – when things turn slightly serious in the last third, we see both actors display their acting chops. See this film for the performances, stay for the feel good.